Though a wet bar is a mainstay in most luxury homes, its design, size and location within the home vary widely. The general compactness of this space—and the loosening-of-the-necktie and kicking-off-of-the-heels that it implies—mean it often becomes a showcase for a designer’s creativity. A wet bar is like a tiny kitchen without the need for quite as many practical considerations. In fact, some homeowners request that the bar serve as an extension of the kitchen, be it tucked off into a nook or butler’s pantry or made a central part of the design, where it might double as a prep station. Others prefer to have coffee bars attached to their master suite—ideal for both nightcaps and Nespresso machines. Still others earmark significant portions of their basement, wine cellar or living area for wet bars, ideal for hosts who’d prefer to keep a crowd out of their kitchen but with a drink in hand during a party. You will not be surprised that most of our favorite wet bars have a Native Trails bar sink in common. Here are 10 designs that inspire us the most. 1. Designer Ellinor Ellefson of Elle Interiors added a wet bar off the side of this Phoenix kitchen. The 15-inch concrete bar sink adds texture and earthiness to an ethereal color palette shared with the entire kitchen. 2. This Houston, Texas, estate recently went on the market boasting a wet bar that had been renovated with granite countertops and warm custom cabinetry. Two wine refrigerators, an ice maker and a Native Trails Mojito bar sink in Antique Copper ensured it was ready to party. 4. Part of a basement remodel by Sneak Peek Design in Minneapolis, this bar is a study in contrasts—cabinetry painted in Sherwin Williams’ Iron Ore, a Ventana bar sink in Ash and a snowy-white quartz countevrtop. 5. “We wanted something that was going to be high style, yet perform in a very practical way,” says designer Jill Wolff of this Hidden Hills, California, kitchen. “The Cantina Pro sink delivered on all fronts.” Along with the wet bar, we were also impressed by the movie theater, spa and multi-car garage/gallery in this home. 6. This five-foot coffee bar in Orange County’s Philharmonic House of Design is the work of Cindy Smetana Interiors. She sourced our Manhattan bar sink in Brushed Nickel, treated the cabinetry to a custom gray-blue stain with a white glaze and had a U-Line refrigerator installed. 7. Jan Kepler of Kepler Design Group’s client fell in love with the Native Trails Cantina copper bar sink in Antique and also commissioned us to create a custom hand-hammered countertop for her celebrity client in California’s central coast region. 8. We’re willing to bet guests gravitate toward the wet bar in this renovated 1926 Colonial home. Nestled into a built-in bookshelf, the bar’s hammered nickel Cabana sink brings a contemporary flair to a rustic and masculine living room. 9. This posh gray wet bar by Chicago area designer Amy Storm (Designstorms) displays an impressive wine collection—and Native Trails’ best-selling bar and prep sink, the Cantina. This bar sits off of the family room/dining room, which Designstorms treated to a total overhaul in 2016. 10. Blink and you’ll miss our diminutive concrete bar sink, the Olivos, in this Austin, Texas, home designed by Kelle Contine Interior Design. This 5,800-square-foot modern farmhouse was part of the Peninsula at Rough Hollow Parade of Homes in 2017 and was completed in collaboration with Cornerstone Architects and Triton Custom Homes. 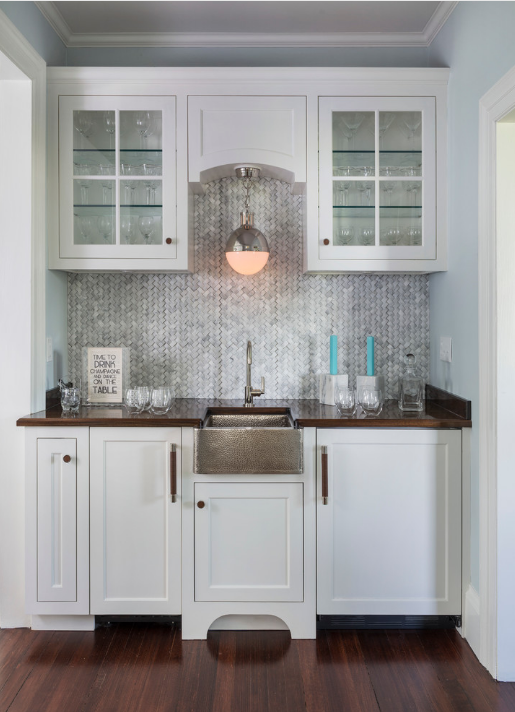 Wet bar by Kelle Contine Interior Design featuring Olivos NativeStone bar sink in Ash. Image by Reagen Taylor Photography. Check out more Native Trails bar and prep sinks here.